Just signed up for the free proXPN service that supports OpenVPN connectivity. Since I use Tunnelblick (OpenVPN client on Mac OS X), it'd be nice not having to install another VPN app. Good thing it's fairly easy to configure. 1. Download and open proXPN for Mac but don't install. It's needed to copy the config files. 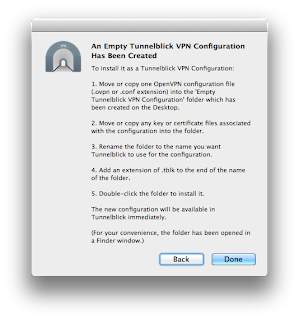 Choose "I have configuration files"
Choose "Create Tunnelblick VPN Configuration"
That's about it! Here are the files to copy into the new Tunnelblick configuration folder. Open the package contents for the proXPN download. Look in /Contents/Resources and copy these files. And remove the "ssl/" directory from the certs. Give it a test, and it connects after logging in. While integration testing a servlet in a real servlet container such as tjws or jetty works well, in development, unit testing just the servlet handler methods is more efficient and provides the granularity in "unit testing". Unfortunately the HttpServletRequest and HttpServletResponse aren't so easy to work with in testing. Fortunately there are many mock frameworks that help. This example shows how mockito helps to test the behavior of the servlet under development. setting the content type to "plain/text"
outputting the response "Hi Nemo!" Three mock objects are used in this test. The mock request simply satisfies the method call argument requirement. Since the servlet does not use the request, the mock request is untouched. The mock response and the mock outputstream verify the desired behavior in the servlet. First, the getOutputStream() call gets stubbed with returning the mock outputstream. Then the servlet's doGet() method is executed with the mocks. Finally, the two desired behaviors are verified. Fix my typo in the servlet, run the test again, and it passes this time. Job done. Let's call it a day! A year ago, it was a bit of a pain to setup Ruby on Rails & MySQL on Windows Vista for the Foundations class at Carnegie Mellon. Download & install Ruby, download & install Rails, download & install MySQL, and spend some time finding a mysql.dll override to get it all to work. A year later, with my first MacBook Pro that ships with Ruby and Rails 2, I thought setting up RoR dev environment would be just installing MySQL. Installing MySQL 5.5 64-bit was a no brainer. gem update --system; no problems there. gem install mysql; ooops... this is where it fell apart. So time to uninstall MySQL 5.5. Hmm... how? Found this set of instructions. Use mysqldump to backup your databases to text files! However, the MySQL 5.1 installer complained that a newer version of MySQL is already installed. One more piece of MySQL to clean up. That got MySQL 5.1 installed. MySQL gem installed and compiled (requires Xcode). It worked! How about that? A presentation from guest speaker Jeromy Carriere in Architecture class. The intermittent system freeze on this less-than-a-year-old laptop was really getting in the way of my grad school remote meetings. Sometimes it'd work for most of the day and would freeze in the middle of a skype meeting. If I reboot just before the meeting, it senses that and freezes up right at the moment I call up class mates on skype. Googling found two potential causes. Luckily the event logs showed "unexpected reboots" starting way back in July 2009. The Realtek RTL8102E/8103E Family PCI-E Fast Ethernet driver had just been updated from Vista updates a few days prior to that. Sure looks suspicious... Driver is provided by Microsoft. Install and check driver in Device Manager, now provider is Realtek and version/date is much older. Clicked on "Update Driver..." and somehow got it to download the latest from Realtek automatically. OK, maybe it works since the provider is still Realtek. And the DV4 laptop is still freezing. Normally this is sufficient reason to buy a new laptop, but hey, grad school ain't cheap... So, try HP's old Realtek driver again. Pre-order your copy of Effective Java (2nd Edition) .